Join up to 24 teachers to explore the nation’s capital as President Lincoln would have known it during the Civil War. 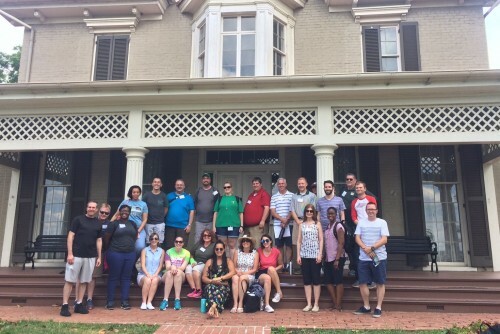 During The Catherine B. Reynolds Foundation Civil War Washington program, you will learn how to use historical sites and primary sources in the classroom, all while developing lasting connections with a national network of fellow teachers and museum educators. These weeklong programs are designed for teachers grades 3-12. Discover historical sites in Washington, D.C., to share with students. Walk in the footsteps of Abraham Lincoln, his “Team of Rivals” and the Confederate spies who plotted against him at Ford’s Theatre. Experience the home of a southern sympathizer in historic Georgetown and learn how she saved her beloved estate from devastation. Learn about Contraband Camps and Emancipation Day as you follow Lincoln’s commute to and from the Old Soldiers’ Home on a hill north of the city. Visit historic Anacostia and the gracious home of Frederick Douglass as he helped raise up the formerly enslaved during and after Reconstruction. Learn skills and strategies on how to use classroom drama to help historic characters come alive. Upon successful completion of the program participants will receive a certificate stating that they completed 34 contact hours. Local participants provide their own accommodations and transportation to program locations each day. Lunch is provided daily. Applicants will receive notice via email that their application has been received. Applicants will be notified of their status no later than April 26, 2019. Program fee includes round-trip air fare and six nights in the historic, Willard Intercontinental Hotel. Lunch is provided daily. Participants in the 2017 Civil War Washington program visit Fort Stevens. Photo by Alex Wood.